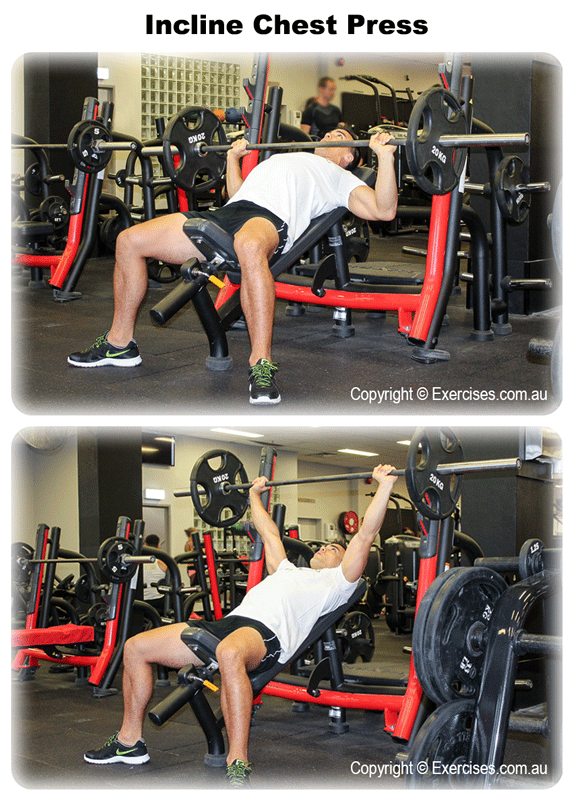 Incline chest press is an exercise that will hit both the chest as well as the front deltoid muscles, helping build strength and size when heavy weight is lifted. Because this is a compound exercise, it should be performed near the start of your workout routine and can be done on a chest or shoulders day – or if you are training both together, is a great way to save time as it will cut down on the number of exercises you need to perform. Position a set of dumbbells, one in each hand on the thighs. Kip the dumbbells up so that they are just resting at shoulder height. Lean back into the bench. Once comfortable, drive the weight up over the head, straightening but not locking the elbows at the top of the movement. Pause here and then lower back down to complete the rep.
Keep the movement slow and controlled to prevent momentum from taking over. Be sure to keep the core tight and the back pressed flat into the back pad.